Lithium Car Battery retailer SA ? Does anyone know where i can find an A123 deep cycle battery for my car ? Never using lead acid ever again. Re: Lithium Car Battery retailer SA ? Lithium doesn't have the energy density of lead acid (which still has the highest by far, the last time I looked) so lithium's might not last as long even though they're supposed to be deep cycle. This will be noticeable when starting your car. Just do a search on Alibaba - there are some Lithium batteries for sale from as little as 45USD - look specifically for LiFe batteries as they are newer generation than Li-ion batteries. The LiFePO4 batteries are exceptional. Not an expert, but like to tinker & explore. Deep cycle batteries are not good for cranking a car (that was about 2 years back). I used my second battery (deep cycle) in my diesel land cruiser that only power the 2 fridges to start my cruiser when we were on a 4 day trip (pole of the other battery snapped off in the battery case on day one) and it did not have enough cranking power on the third and fourth day to start the cruiser. Need to jump start it. Once we hit the tarred road back home and travel for 3 hours at speed, it was able to just about crank and start the engine at the service station when I filled up. The "normal" lithium car batteries are good. Mine is cranking a diesel land cruiser and going for the third year. All these modern and some fancy ideas can bite extremely hard in many cases,in some its heaven on earth but it come with its own set of thorns. Standard car charging circuitry is based around lead acid batteries with a fluctuation around 13.8 volt and at around 80 amp max(this is actually around 40--some as low as only 15 amps max in all standard alternators fitted to cars). Cars do not need deep cycle discharging over long periods,but extreme heavy current for short periods. Its charging cycle is just the same as that is what cars do for its lifespan. Once you start to add batteries/change type, divide charging current and whatever, then not only do you look at the batteries,but you must also look at your charging situation and if the alternator fitted can handle it and provide the different charging voltages/amperes required as per battery and its various stages of charging it go through. Just changing one will lead you into a very dark field. Also,one need to fully understand the actual technical workings around each type of battery as each type needs its own charging requirements to operate 100 %. Just because specs look wonderful on a graph or paper,do not mean it will function accordingly to your requirement or where you fit it in unless you change the charging system accordingly. For a standard car, stick to its prescribed lead acid battery---cheapest way out, and that is the short and long story of batteries. I think there is actually people here that is 100 % in the actual business of batteries and chargers which can give better advice.. If you add batteries for fridges, upgrade the alternator,as what you bargain on in theory,might bite hard on the reality side of affairs. Lead Acid has a better/safer power (energy) delivery. Lithium can deliver lower level energy over a longer period, but for the surges required for starter motors, Lithium is 'riskier' than Lead Acid. 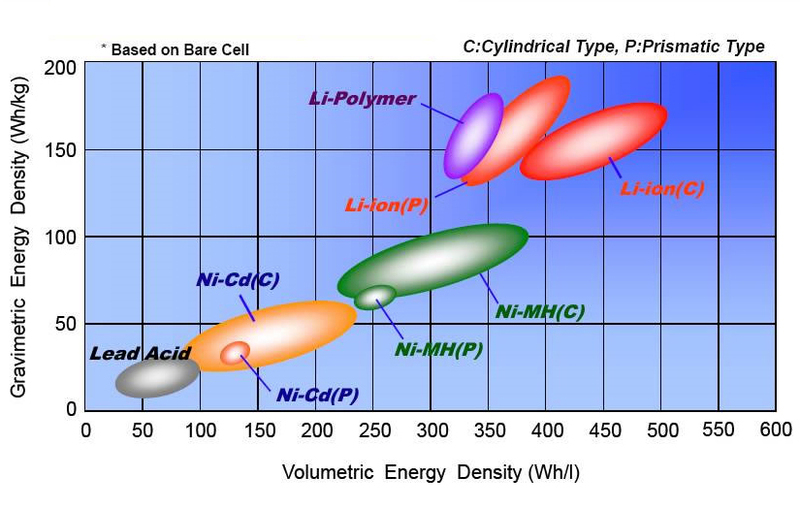 Lead Acid internal resistance is a lot lower than Lithium and at the moment there's no getting around that without compromises (paralleling more Lithium cells.) to reduce heat production and runaway thermal effects. Also (as Dany says) in order to control Lithium 'fancy' electronics must now be installed. Power systems like this, are generally not 'safe' in the hands, and/or do not last long in the hands of ordinary Jill and John Soap, and repairs/maintenance will get very expensive. I deal with this type of thing (power systems) every day, and for me it's still Lead Acid for the time being. Lithium also has a better power density than lead acid - but not much. Also, LiFe particularly does not need 'fancy' protection - a simple low voltage cut-off and over-current trip will do fine for most applications. A properly sized and specified Lithium battery will out perform Lead Acid in every respect. Except possibly price - but even that is reaching break even point now (given the improved cycle life of Lithium batteries). Think of it this way.. So there are temperature sensors and 'electronics as standard' on any Lithium battery, used to reduce the (dis)charge rates. Without the protection goodies (and they do fail).. your world goes up in flames and smoke, and with a fuel tank/fuel lines full of octane nearby. You will need a special battery charger specifically for these types of batteries. Don't worry about old age, it doesn't last long. Lithium batteries started with LiIo, followed by LiPo and last in the chain LiFe. Due to the incorrect handling of these batteries some incidents put them in a bad light with the general public but if one were to look at the number of these incidents versus the number of these batteries in use today, it is actually not really worth the mention. Very few people read the "warning" labels on the products and by remaining ignorant, they abuse the product with the occasional "burn", "explosion" etc. Of the three types, the battery that can give the most energy in a short period of time is the LiPo, followed by LiIon and then LiFe. Of the three the most "unstable" is LiPo, followed by LiIon and again LiFe last. LiFe battries for instance only become unstable at temperatures around 800 degrees C.
If charged, used, and stored correctly, there should be no incidents with any of these batteries and I really do not see any good reason for not using this technology. I for Instance have a handheld 6000mah LiPo pack in my car and have helped "JUMPSTART" quite a few cars with this small handheld pack of energy. Apart of the energy density of Lithium technology, there is an added benefit in that the chemicals used are environmentally friendly. On a dead / fully discharged battery one remove all plastic for recycling, and the rest can be safely worked back into the ground. Lithium for instance are used in Pharmaceuticals for human consumption, Iron we all know, and the rest is actually fertilizer for the soil. A lot of Lithium batteries coming onto the market nowadays are "smart" batteries in that they come with installed circuitry that ensure correct charge and balance take place for each individual cell. At the moment those that are already entrenched in the manufacture and distribution chain are "coining" it but as demand increases and more players enter the field, prices will come down. Lead Acid proponents will try and stick to it as long as possible simply because of their captive lucrative money making automotive market. The culprit is not the battery but the end user of the battery. Lithium Ion and LiFe (short for Lithium Iron Phosphate) are completely different beasts. You way want to read up on them a bit before commenting? A lithium battery properly sized for the application will not get any hotter than the equivalent lead acid. If you use the wrong spec battery, expect problems - but that is true for any battery technology. Lithium battery protectors are fail-open - so if they do fail, the battery disconnects entirely. LiFe batteries typically only have a fuse - so even less to go wrong. Just consider how many lithium batteries are around you at the moment. Laptop computers, cell phones, solar lamps, electric cars, electric bicycles, cameras, calculators, powerbanks, etc. Far more installed globally than lead acid batteries, yet actual battery fires are so rare that they still make the news if they do happen. Each battery to its own environment. Why re-invent the wheel. Keep things simple. If this car came out with Lithium,then so be it and with right replace same. But if not, you need to sit back and think carefully. The environment in cars is by far not even close to 90% of all other types of batteries used around the world.. The design around where the battery is mounted, the charging system all will be in balance. To just throw out a standard lead acid and go into so called better specs is a recipe for lots of tears. If you got starting problems, changing to a "better" battery will and cannot solve your problems unless positively identify the problems and repair it. My problem is simple really. A typical 12-volt lead-acid battery must be taken to approximately 14.2-14.4 VDC before it is fully charged. (For 24 volt systems, double these figures.) If taken to a lesser voltage level, some of the sulfate deposits that form during discharge will remain on the plates. So in the past i did exactly that with many batteries with NO problems. This time with a different car when i have taken it up to 14.40 it spilled. I don't want acid in my car ever EVER AGAIN... i had my crazy days with the consequences for 5 lifetimes, and i hate the Chore of 1 HOUR to get the battery out from it's special location to charge it externally, then taking the dumb caps off for the stupid battery to vent if needed and doing the usual top up every few months to make sure the plates are saturated, I can't even get to the darned caps to open and check them when the battery is bolted in its original place SO without a doubt whatsoever, getting a Life battery is the obvious choice. Also you cannot electronically probe individual cells on a lead acid battery, so when you want to put it on float charge or try to take it to full charge you might very possibly get a spill, which is likely what happened in my case, i want to know what my cells are doing, or at least what their individual voltages are, not guess. Last edited by skytrooper on Tue Feb 12, 2019 2:45 pm, edited 3 times in total.